Multi purpose tool for machine quilters. 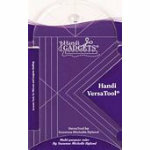 Easy to grasp and designed to fit comfortably in a quilters hand. Use with any brand mid arm or long arm quilting machine. High quality acrylic14" inch thick insures safety when used with a hopping foot. Etched lines provide long lasting accuracy when quilting.